Result: Nick Kyrgios defeated Kyle Edmund by 4-6, 6-3, 6-3. Kyle Edmund took the lead by winning the first set. However, Nick Kyrgios made an excellent comeback and won the second set. In the decisive set, Nick Kyrgios dominated again, thus winning the match. Now Nick Kyrgios will face Feliciano Lopez in the Quarter finals of Queen’s Club Championships 2018. Result: Novak Djokovic defeated Grigor Dimitrov by 6-4, 6-1. Although, Grigor Dimitrov struggled hard in the first set but still he lost it by two points in the end. In the second set Novak Djokovic again claimed the victory by winning it from 6-1, thus advancing into the next round. This is @DjokerNole‘s 799th Career Match Win. It was an easy win for Novak Djokovic and a humiliating defeat for Grigor Dimitrov. Novak Djokovic finally made it to the Quarter finals where he will now face the Frenchmen Adrian Mannarino. 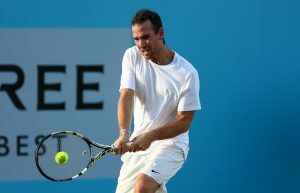 Result: Adrian Mannarino defeated Julien Benneteau by 7-6(4), 6-3. A tough fight was seen in the first set between Adrian and Julien as it came to a tie-breaker. Adrian Mannarino won on the tie-break in a dominant fashion. Great win for @AdrianMannarino! 7-6, 6-3 against Benneteau. Into the QFs at #QueensTennis for the first time since 2011. His game suits the grass. He will play Djokovic next. However, Julien Benneteau struggled hard to win the second set but he lost a total of three points on his serve, thus losing the match. 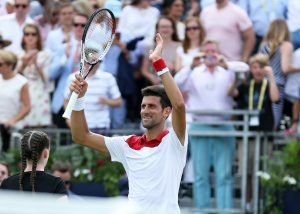 Adrian Mannarino will now face Novak Djokovic in the Quarter finals of Queen’s Club Championships 2018. Result: Jamie Murray and Bruno Soares defeated Wesley Koolhof and Marcus Daniel by 6-3, 7-6(2), 10-7. Jamie Murray and Bruno Soares won the first set in a dominant fashion. However, Wesley Koolhof and Marcus Daniel made a magnificent comeback and won the second set on the tie-break. But Jamie and Bruno won the decisive set after a tough fight and booked their place into the next round. Jamie Murray and Bruno Soares will now face Oliver Marach and Mate Pavic in the Quarter finals of Queen’s Club Championships 2018. They’ve done it! 👊@jamie_murray and @BrunoSoares82 are on track to defend their #QueensTennis crown – they have beaten Koolhof and Daniell 6-3 6-7 10-7 to progress to the semis. Result: Neal Skupski and Kyle Edmund defeated Nick Kyrgios and Lleyton Hewitt by 6-1, 6-4. 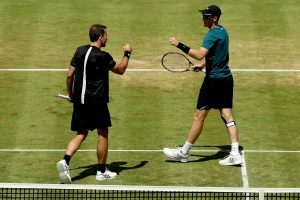 Neal Skupski and Kyle Edmund commanded an easy victory in the first set. 👊 In lovely early evening ☀ @kyle8edmund & @nealskupski claim a 6-1, 6-4 win over Hewitt & Kyrgios at @QueensTennis! 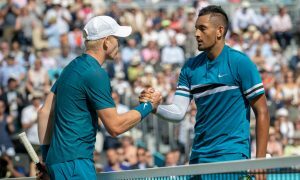 In the second set, Nick Kyrgios and Lleyton Hewitt showed some fight but the British pair also won this set, thus winning the match. Now Neal Skupski and Kyle Edmund will face Henri Kontinen and John Peers in the Quarter finals of Queen’s Club Championships 2018. Result: Henri Kontinen and John Peers defeated Jack Sock and Mike Bryan by 6-3, 6-4. Despite a good performance, Jack Sock and Mike Bryan didn’t make it to the next round. Henri Kontinen and John Peers opened the scoring of the first set and eventually won it by 6-3. Although, Jack Sock and Mike Bryan took the lead in the second set but they again faced a terrible defeat and were knocked out of the championship. Henri Kontinen and John Peers will now face Neal Skupski and Kyle Edmund in their upcoming match. Do join allsportspk to see the highlights of the 7th day of Queen’s Club Championships 2018.